More than 50 years of civil war and bloodshed have been officially brought to an end with the signing of a peace deal between Colombia and Farc rebels. 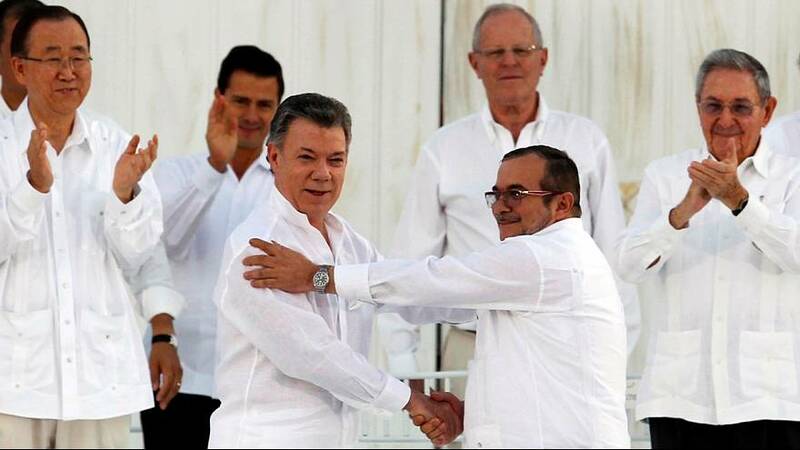 In a ceremony in the Colombian city of Cartagena, more than 2,500 foreign and domestic dignitaries, all dressed in white as a symbol of peace, saw the Farc leader and the country’s president sign the historic document. It was also the first time that Rodrigo Londono, known as “Timochenko” and President Juan Manuel Santos were able to shake hands on Colombian soil. The deal was signed with a pen made from a bullet to illustrate the transition from weapons into education and the future. At which point men women and children arose as one and joined the president in chanting “no more war”. In his address, “Timochenko” asked for forgiveness for all the pain caused to the victims of the conflict. More than a quarter of a million people died and thousands more were displaced by the years of violence. The agreement to end Latin America’s longest-running war will turn FARC guerillas into a political party fighting at the ballot box instead of the battlefield that have occupied since 1964. FARC which stands for the Revolutionary Armed Forces of Colombia, began as a peasant revolt, became a big player in the cocaine trade and at its strongest had 20,000 fighters.Now it must hand over weapons to the United Nations within 180 days. Colombians are believed to be nervous over how the remaining 7,000 rebels will integrate into society, but most are optimistic peace will bring more benefits than problems. Colombia will vote on October 2 whether to ratify the agreement, but polls show it should pass easily. The deal has been lauded by the international community. The European Union is to remove the FARC group from its terror list. The US has pledged 390 million dollars to support the peace process.